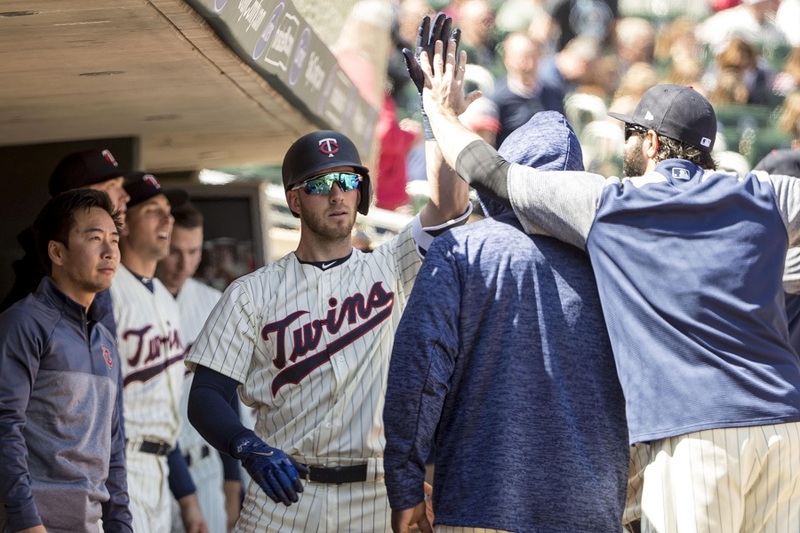 When Jason Castro went down with an injury, it could have been easy for Twins fans to think it was another bad omen for the 2018 campaign. Big time contributors from last year like Byron Buxton, Miguel Sano and Ervin Santana have all spent time on the disabled list to start the season. Another regular missing time could have been a nail in the coffin. Enter Mitch Garver. The 27-year old catcher has played fewer than 50 games at the big league level. However, Castro’s injury (and now surgery) is giving Garver the chance to prove he belongs at baseball’s highest level. What can Garver do to make the most of this opportunity? As spring training began, there were questions about whether or not Garver would break camp with the club. Other veteran options were in camp and he didn’t exactly hit the cover off the ball during his debut. In the 2017 season, he hit .196/.288/.348 with four extra-base hits in 23 games. After combining for four triples in his entire minor league career, he collected three triples out of his nine total hits. Garver has made a few changes at the plate this season. After barreling up the ball 3.2% of the time last year, he has raised that percentage to 8.1% this season. This has helped to increase his exit velocity from 86.8 to 88.0. His launch angle has also been impacted as he moved from 10.5 last year to 18.0 this year. His change in launch angle has resulted in his OPS increasing by 140 points. Another change for Garver this season has been an increase in his BABIP. Last year, he ended the season with a .290 BABIP. This year his BABIP has risen to .343 so there might be some luck involved with the big jump. One could expect Garver’s batting average to drop as teams figure out how to defend him. During his minor league career, Garver hit .271/.364/.429. Defensively, Garver started four games at catcher last season. He’s already more than doubled his amount of innings behind the plate. This year he has allowed seven stolen bases and thrown out two potential base stealers. His 22% caught stealing percentage is lower than the league average (28%). Throughout his minor league career, he had a 32% caught stealing percentage. To make the most of this opportunity, Garver needs to continue to make offensive strides. There have been some small adjustments this season but he dominated at the upper levels of the minors. He hit .298/.386/.520 in 110 games with Rochester over the last two seasons. If that version of Garver shows up at the big league level, his defensive flaws will be easier to swallow. What do you expect from Garver in the years to come? Leave a COMMENT and start the discussion. I wrote a post/article breaking down Garver the other day as well--I'm also interested in him and think there's a little bit there...although there's also some work needed. Mods feel free to merge either way or merge my thread into here.I'm all about generating discussion and don't care how that happens. I a fan of Garver, as I think his bat will play well enough at the big league level. I am also not worried about his arm, as he appears to be ok there. I am concerned about the rest of his catching skills, and am hoping he can work through those. If he can get to average behind the plate and a plus bat, that will be just fine. Surprised about his CS thus far considering his past rep and production in this area. SSS thus far, or pitchers not holding runners better? I've seen good Garver and not so good Garver behind the plate. I think we are looking a bit at a work in progress all things considered. Coincidence or not, we've seen him behind the plate in some of the best pitching performances this year so far. I like the bat potential and the compact swing that seems to really pop. Good for him. Maybe his relatively "advanced" age has helped, but he doesn't seem intimidated or hesitant in his new role as the main catcher. I don't think many people were happy to see Castro put on the DL, but I think putting Garver behind the plate more has given him the experience and confidence he needs to thrive. Garver is doing fine for his first full-year in the bigs. I like his bat and if he makes even modest improvements there he's going to be a nice asset at catcher. I still have some concerns about his defense, but he's been looking a bit better back there as of late; it may be that more consistent playing time will help him do better there, so Castro's injury could be a real blessing for Garver. His splits so far are interesting: he's absolutely raking against RHPs and is a disaster against LHPs to date. Did not expect that from him, but probably more about SSS than anything else? I think Garver can be a better than average MLB hitter. With regular PA, his BABP will go down but his K-rate should go lower too. He's hit at every level. His glovework isn't great but he's called some decent games. He definitely has a chance to be an everyday catcher.